I have a vintage friend named Mr. Dino. Have you ever heard of him? Could it be the name of a character in the legendary 1960s Hanna Barbara cartoon The Flintstones? Or is it a name referring to a dinosaur nicknamed by some kooky archaeological scientist in the ’70s? Or better yet, is it code name for a mobster of the ’30s who abbreviated his tongue-twisting last name to the more speakable “Dino” for (gulps) business purposes? Perhaps Mr. Dino could have been any of the above, but the good news is that he’s rather a legend of ’60s fashion experiencing a resurgence today. 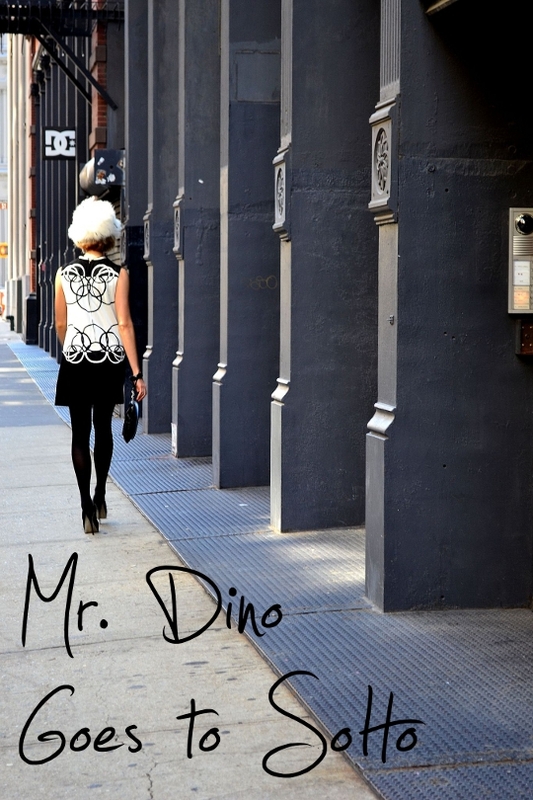 Which is why I decided to share the joys of my first Mr. Dino dress and his little trip to a side street in SoHo. Mr. Dino is an illustrious designer from the 1960s who once dined with many a fine lady. These fine ladies enjoyed wearing his op-art prints to social soirees, artistic affairs and to raise eyebrows whilst shopping around town. Mr. Dino made dresses of designs compared to the likes of Emilio Pucci. But for some reason, while we all know Mr. Pucci by both first and last name basis, the average #vintagelover (not to mention American woman) is hardly familiar with the pseudonym Mr. Dino. Meet my friend Mr. Dino, a character of the ’60s you’ll want to wear everyday of your modern life. 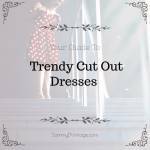 Check out these Mr. Dino Vintage Dresses on eBay! Or say hello on Twitter, Facebook, Instagram or subscribing to my newsletter. 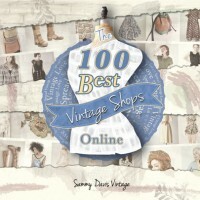 Check out my book, the 100 Best Vintage Shops Online, now for sale on Etsy! According to the Vintage Fashion Guild, Mr. Dino’s real name was Max Cohen. The name Mr. Dino was inspired by Rat Pack legend Dean Martin, whose nickname was “Dino” in the 1950s and 1960s. Mr. Dino’s ascent onto fashion came at perfect time. The 1960s was ripe for experimentation with design, color and the presentation of the female form to the world. 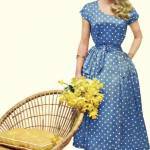 No longer did a woman have to wear a stoic frock of solid colors and fitted shape. In the ’60s, the fabulous, fun and fancy-free reigned supreme. 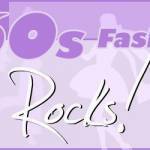 The brand was founded in 1958. Mr. Dino sold his shares of the company to US Industries, but remained CEO of the company. He later founded St. Maxime, a bathing suit line named after an exotic beach town in France. However, a quick Google search of St. Maxime only presents a handful of vintage St. Maxime bathing suit options for purchase. Mr. Dino’s op art designs (defined as being “conflicting patterns” of “abstract designs”) are often compared to the likes of Emilio Pucci, who had much more fame and therefore influence over fashion. One could argue that Mr. Dino was perhaps influenced by Pucci, or maybe they were just riding the trend without awareness of one another’s collections. 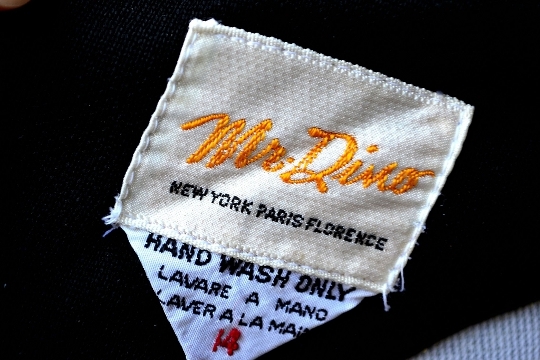 Mr. Dino is so revered because according to records, he designed each and every one of his garment designs. Founded in Miami, his dresses were designed, screen printed and manufactured in his Miami-based factory before shipped to the far corners of the country as works of art for the refined lady looking to invest in a trendy garment of fine quality and craftsmanship. 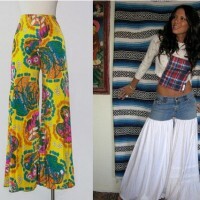 His designs are sold today for a fraction of their actual worth in the ’60s. Retailing for an average of $100 a dress, investing in a Mr. Dino is investing in a piece of history with a name that with such fresh design and fit, will always be your fashion friend. I first caught sight of my Mr. Dino dress in the window of Malena’s Vintage Boutique, my favorite vintage store in Philadelphia. I walked into the boutique and asked Malena, it’s owner, if she’d kindly remove that amazing dress from the mannequin for me. I added a few other options to my fitting room “just in case” the Mr. Dino wasn’t a winner. But of course he was – the first fitting was perfection! 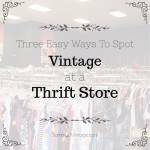 – and I gladly returned the other vintage garments to their racks for other #vintagelovers to scoop up. The B&W color block and circular abstract mystique of this dress is so reminiscent of the ’60s mod era I wish I could have lived. Owning him is like having a piece of history, or perhaps a glimpse into one of my past lives. I paired my Mr. Dino dress with black and white accessories, black shoes and an ostrich feather hat. 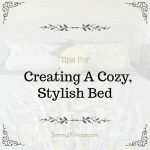 Without having to create a complimentary colorway, I’ve turned to B&W for a look of basic colors that despite being so monochromatic, radiate a beautiful afterglow. A great outfit that makes us feel good helps us to shine our lights from within. But no matter what it is we wear and when we wear it, what leaves the best impression is shining this eternal beauty. I can be wearing my Mr. Dino but if I’m in a sour mood, you aren’t going to remember what I wore for its beauty, but the energy I emitted for its negativity. And with that impression, you aren’t going to want more of me or Mr. Dino! 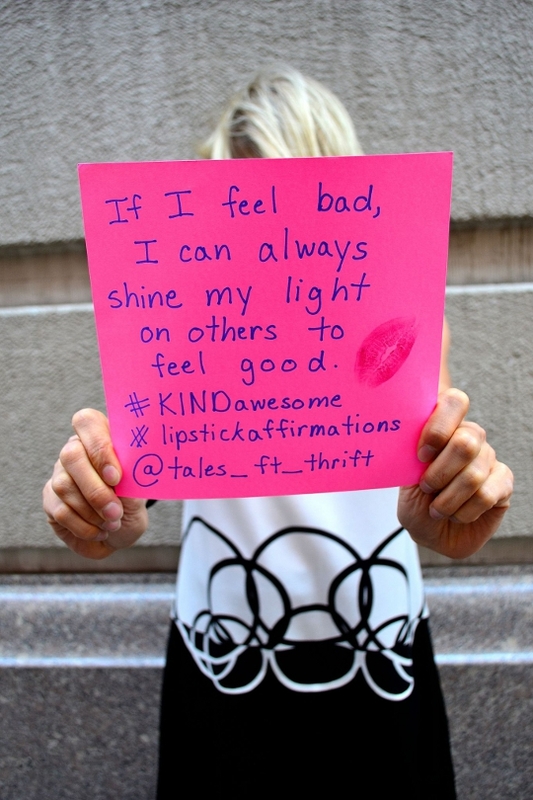 That’s why today’s #lipstickaffirmation (a campaign for more self-love I’ve started on Instagram) is from blogger Tales of the Thrift, reminding us that no matter we may be feeling, we can always shine our light on others to make them and ourselves feel better. Our external beauty is fleeting. We “dress up” to display it to the world. But the compassion we can show our friends, family and strangers we meet needs no dressing up. 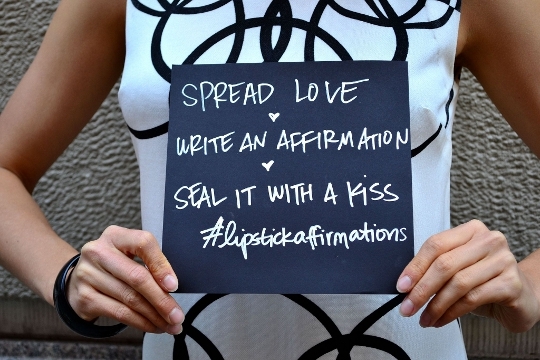 It just is – but it’s up to us to decide to shine it on the world. 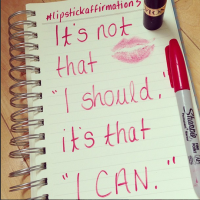 And that’s how I feel about self-love and the power of positive thinking! 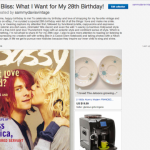 Read my e-book for FREE here! 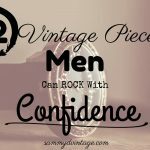 Want to sell vintage clothing online? I’ll share my secrets of the trade with you. Here’s how! I adore Mr. Dino dresses!! I’ve only come across two, but they’ve both been amazing!! Your black and white one is perfect. Well, look at you, Sammy, looking all cute in your little mini B&W dress and fuzzy hat! WOW! Speaking of Dean “Dino” Martin, I saw one of his movies the other night called “Murderers Row” from 1966. It’s a Bond-like, spy spoof that I could have easily passed on if it wasn’t such a great vehicle for over-the-top, women’s fashion from the 60s. It included Ann Margaret who was also wearing an awesome, black & white, mod style mini.